We live in a culture obsessed with celebrity. When we're not trying to make a name for ourselves, we're following the big names on Twitter, liking them on Facebook, and taking selfies with them if we are lucky enough to run into them in real life. We love winners and we want to be winners. But take it from a man who knows more famous people than most of us will ever meet--it's not who you know that's important, it's who you are inside. With short, story-driven readings, Pat Williams draws from over fifty years of brushing shoulders with the greats, offering readers motivation to do their best, be themselves, and continually strive to be the people God made them to be. He shows that being a "winner" is more about character, attitudes, values, and faith than it is about coming out on top. 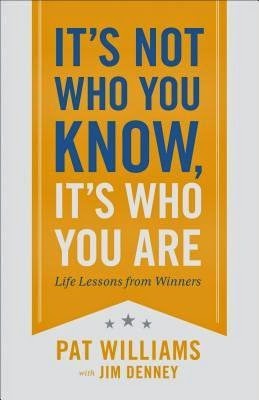 Stories from legendary sports figures, leaders, and fascinating people from all walks of life help readers develop true character that speaks for itself. Have you ever really needed a book that you could put down at anytime and you knew it'd be right there waiting for you when you got back, sort of like an old friend? If this makes any sense to you, this is that book. Filled with short narratives from every type of celebrity imaginable, you can read one or you can read ten and when you come back, there is more waiting. This is one of those books that you're going to get from it what you put into it. It can be read casually and you'll just enjoy the stories. It can be read with some depth and you're going to take away a life lesson from each and every one. The author doesn't always tell you what the lesson is, but it is always there. For me, this came at just the right time and it's going into my "life lessons to access" bin of books that sits on top of my dresser. Few make it in but this one won't be going anywhere.